Victor Charles Kallal, family patriarch and centenarian of Greenville, Illinois, died peacefully at Faith Countryside Homes in Highland, Illinois on October 25, 2018. His lifetime spanned 12 decades and 20 U.S. presidents. Vic was born 6 December 1908 on a farm in English Township, Jersey County, Illinois. He was the first of twelve children born to Teresa Barbara (Kroupa) Kallal (1883-1973) and Joseph Victor Kallal (1882-1969). Both parents were first generation Americans whose ancestors had emigrated from Bohemia (now Czech Republic) in the early 1850s. Responsibilities come early on a farm and Vic's first memories included fetching wood for the kitchen stove and tending younger siblings. Manual labor of farm chores began as a child. He drove horses in the field when he was 8 years old. Vic first walked to a one-room school. From age 10 he drove a horse and buggy with siblings and neighbor children; first to St Mary's school near Fieldon and later on a 14-mile round trip to Jerseyville. He graduated from Jerseyville high school in 1926. The Kallal brothers were expected to work like men from their teenage years. On a raw December day in 1929 he hand picked corn all day with younger brothers and they earned nothing. At daybreak the next day the brothers were back in the field again. After supper that evening only Vic received an IOU from his father, discounted for his room and board; it was his 21st birthday. Vic embraced new technologies and modern farming methods. He began driving tractors when his father still preferred horses. He studied electrical applications when 9 out 10 farms and most rural communities in Southern Illinois had neither electricity nor running water. He earned a degree in agricultural engineering from the University of Illinois in 1934. Later that year he married his sweetheart, Catherine Marie Murphy, at St Francis Xavier Catholic church in Jerseyville. He first came to Greenville in May 1935 as a Department of Agriculture advisor for soil conservation. He taught Civilian Conservation Corps workers the best pratices for field terracing, soil erosion control, and reforestation. When the Bond County CCC camp was disbanded in 1936 he returned to work as a hired hand on his father's farm. In June 1939 Vic was chosen as the first manager of Southwestern Electric Cooperative. This new cooperative, sanctioned by the federal Rural Electrification Administration (REA), included rural areas and villages of Bond, Madison and Fayette counties. He moved his family to Greenville and began his career in rural electrification. The REA enterprise was started from scratch. The first Greenville office opened on the West side of South 2nd Street with one desk, one telephone, one secretary, and Victor. Low cost, long term federal loans funded the design and construction of electrical distribution systems for rural customers. The initial task was to obtain rights-of-way to build power lines into the countryside for the early subscribers. Each new electrical power turn-on was big news in the 1940s. Rural electrification provided an enormous increase in farm productivity during World War II. American farmers not only fed our nation and deployed servicemen, but also produced surplus food to share with allied nations and refugees. Electrification improved the quality of life for families and stimulated the economies of rural communities across the service area. The REA membership expanded rapidly after WWII. By the 1950s there were about 5,000 service sites and 35 full time employees. In response to the growing demand for service, Vic managed the design and construction of a new office/service yard complex on South Third Street (present-day Greenville Municipal site). Vic was a founding member and past president of the Greenville Kiwanis Club and member of the Commercial Club. He and Catherine were early donors during the 1950s campaign to build the Utlaut Hospital in Greenville. The family grew to eight children. Every year between 1941 and 1970 one or more of the Kallal children attended Greenville public schools. 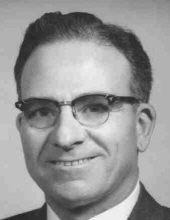 In later years Vic became regional sales engineer for an electrical hardware distributor. Clients included municipal utilities and REA cooperatives in Illinois. Catherine and Vic were blessed with a happy marriage, years of good health and retirement travel. They enjoyed the popular card games of Canasta and Pinochle with other Bond County couples. Joyful anniversaries and reunions marked their years; the focus was always family and gratitude. A weekend celebration and Mass of Thanksgiving highlighted their 65th wedding anniversary. Vic's life long habit was to keep busy. Catherine became skilled at leather carving and Vic did the assembly and lacing. They created dozens of richly carved leather purses, wallets, belts and camp stools now treasured as family heirlooms. Vic was a cross word puzzle expert and frequent winner at kitchen table Scrabble. He tended roses for Catherine and a small garden for their table; trimmed his Oak trees, mowed the lawn and passed his annual driving test until his 99th year. Vic tenderly cared for Catherine as her health declined. When she died in 2006 they had been married for 72 years. In 2008 Vic was invited to the 70th annual meeting of the Southwestern Electric Cooperative. During a brief talk he charmed the audience by praising the members and the cooperative model for the common good. Later that year, his 100th birthday was celebrated with over 200 friends and relatives gathering for dinner, laughter, and reminiscences. Vic was a Christian gentleman and devout Roman Catholic; he attended daily Mass for many years. He joined the Knights of Columbus in January 1929 and later became a Fourth Degree Knight. Vic was a loyal benefactor of Greenville's St Lawrence Catholic Church for over 75 years. He served on the parish council and helped finance the new church completed in 1993. Surviving children (spouses): James J. (Stephany) Kallal of Huntington Beach, California; Charlotte M. (Roger) Sugg of River Forest, Illinois; Kathleen A. Sullivan of Greenville, Illinois; Patrick J. (Linda) Kallal of Bend, Oregon; Thomas C. (Ellie) Kallal of Scottsdale, Arizona; and Barbara J. (Thomas) Grace of Kenosha, Wisconsin. Also surviving: daughters-in-law Judith Ann Kallal of Cheyenne, Wyoming, Barbara Jean Boyden of Wilmington, North Carolina, and Deborah Marlene Smith of Martinsville, Indiana; 16 grandchildren and 28 great-grandchildren. Besides wife Catherine, he was predeceased by: sons John Victor (1940-1997) and William Lawrence (1944-2013); granddaughter Jacqueline Kay (1965-2007); grandson Jacob Richard (1976-2015); great grandson Jacob Joseph (1984-2012); and by six brothers and five sisters. Visitation: 4 pm to 7 pm, Tuesday, October 30, 2018 at the St. Lawrence Catholic Church, Greenville, IL and one hour prior to mass. Memorial contributions to these Bond County charities will be accepted by Young Funeral Home and by St Lawrence Catholic Church. To send flowers or a remembrance gift to the family of Victor Charles Kallal, please visit our Tribute Store. "Email Address" would like to share the life celebration of Victor Charles Kallal. Click on the "link" to go to share a favorite memory or leave a condolence message for the family.